Cupcakes have proven themselves to be much more than a fleeting baking trend. With the amount of cupcake bakeries, reality television shows, and recipes in general, it’s clear they’re here to stay. Cupcakes are much easier than layered cakes to bake and transport, not to mention their cute size makes them the perfect indulgence for just about any occasion or holiday, like Halloween! It’s no wonder they’re so popular. Despite their popularity, many cupcakes you find at the grocery store bakery are either bland or cloyingly sweet. Not to mention so many have an awful crumbly or greasy texture and artificial aftertaste. 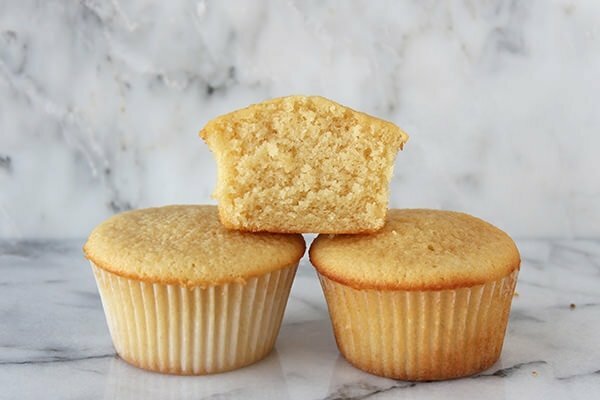 Homemade cupcakes are always better, and most recipes out there for basic yellow cupcakes are fairly similar. 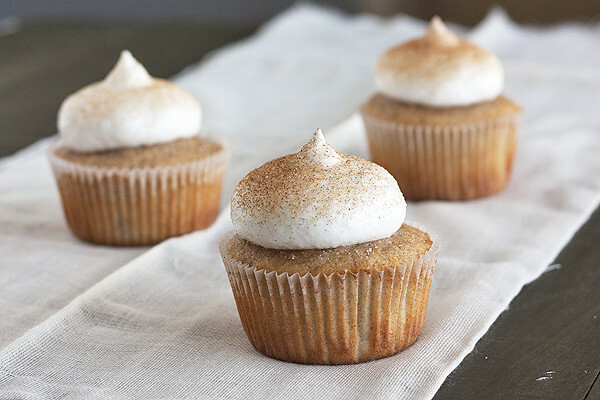 Small changes in the flour, fat, baking times, and baking temperatures, however, can result in very different cupcakes. 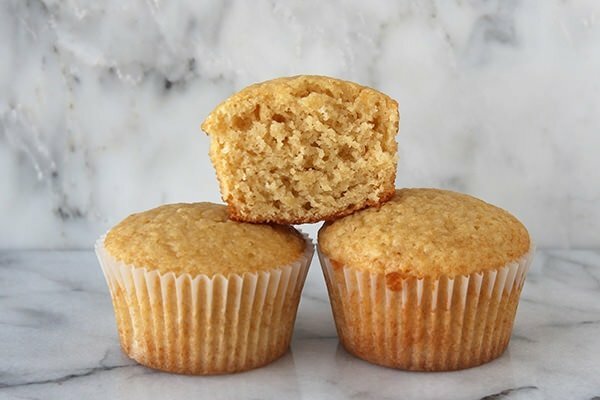 For this round of kitchen experimenting, I tested six batches of cupcakes to discover what makes a cupcake domed or flat, rich or crumbly, soft or slightly chewy, to help you create your version of the perfect cupcake. Since most cupcake recipes are very similar, I used a very basic recipe that is from no one source in particular as my control recipe. From there I tested how cake flour, extra egg yolks, sour cream, oil, and a lower baking temperature affect the cupcakes. To keep the results as consistent as possible, I used the same ingredients, utensils, techniques, and bakeware when applicable. I also maintained a 350°F oven temperature and a twenty-minute baking time when applicable. Take a look at the results to see the ins and outs of cupcake baking; I hope they help you discover the tricks to making your version of the perfect cupcake! For this test I substituted the 1 1/2 cups (6.37 ounces) all-purpose flour in the recipe with 1 1/2 cups of sifted Swans Down brand cake flour, which weighs 5.25 ounces after sifting. Everything else in the recipe was left as-is. The cupcakes were visibly lighter in color with very domed tops. The texture was super fine and soft but also on the dry side with a slight crumbly feel. In taste testing these cake flour cupcakes I felt that using all cake flour was too much. 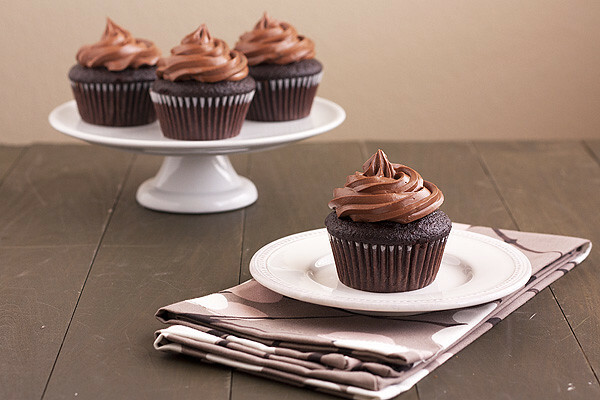 If you want to make your cupcakes softer you might consider using half cake flour, half all-purpose flour. In addition to the one whole egg called for in the control recipe, I added an additional two egg yolks to test how they affect the cupcake’s texture and flavor. The additional egg yolks not only lended a deeper yellow tint to the cupcakes, they also domed slightly more than some of the other tests. The batter itself looked a little grainy, which concerned me, but the baked results were slightly chewy yet still soft, ultra moist, and full of rich flavor, all desirable traits in a cupcake. These egg yolk cupcakes would stand up nicely to a rich and thick frosting. 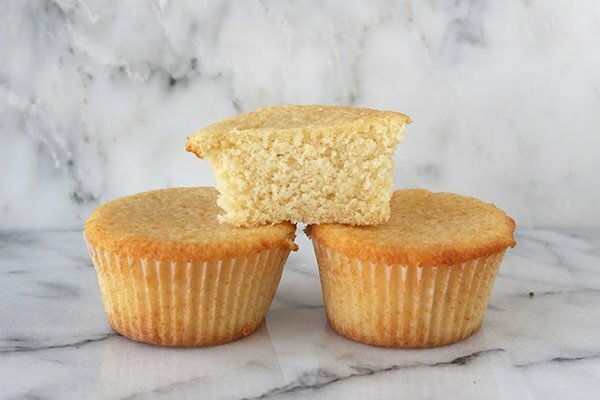 I enjoyed the taste and texture of these cupcakes and will probably use at least one additional egg yolk in my yellow cupcake recipes from now on. The control recipe calls for milk, but there are many cupcake recipes that call for sour cream instead so I decided to test the difference. I substituted the exact amount of milk with plain sour cream. The batter itself was visibly thicker and tighter, not quite as loose as the control batter. The finished cupcakes were denser and slightly chewier than the control, with the perfect amount of moisture. They also had a slight tang, which added a nice depth of flavor. These sour cream cupcakes and the egg yolk cupcakes proved to be my favorites. 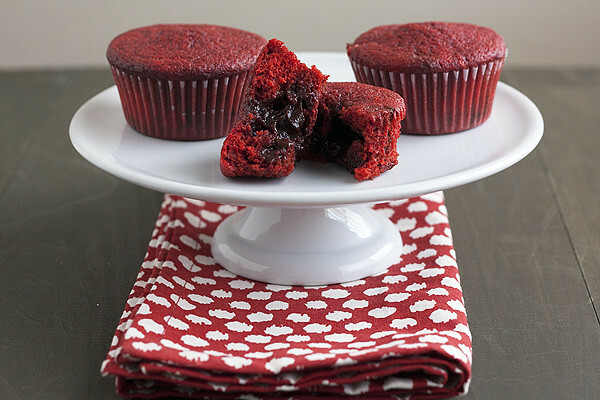 Most yellow cupcake recipes use butter as the main fat, however quite a few recipes for chocolate cupcakes or red velvet cupcakes use oil instead. I wanted to see what kind of difference oil makes so I substituted 1/2 cup canola oil for all the butter called for in the control recipe. Instead of beating the oil and sugar together, I simply mixed very well by hand. The resulting cupcakes were unsurprisingly very similar to muffins in their appearance and texture. They were spongier than any of the other cupcakes but also had the worst flavor. These cupcakes almost tasted like they were fried to me, that’s how pronounced the oil taste was. There’s definitely a reason why oil is only reserved for chocolate or red velvet cupcakes, which include flavorful ingredients that mask the oil flavor. 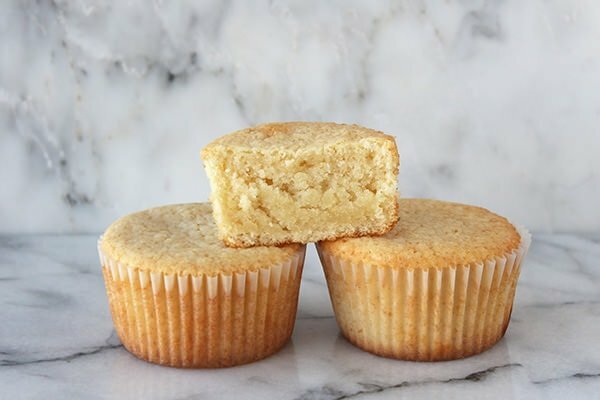 I would definitely stick to using butter in yellow cupcakes because it provides that characteristic buttery flavor and light, finer-textured crumb. For this test I took the exact control recipe but baked it in a 325°F oven for 22 minutes. I peeked through the oven window to watch these cupcakes as they baked and they domed up surprisingly high during baking but proceeded to collapse slightly during the last minutes of baking and during cooling. As expected, they didn’t brown as much as the control cupcakes and were actually extremely difficult to remove as the edges had overflowed and stuck to the tin. Since they were so soft and tender, I ended up damaging a few of the cupcakes while trying to remove them from the tin. 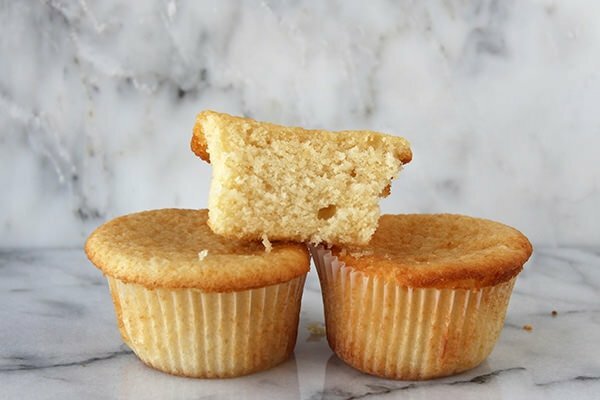 This dilemma surprised me and I would certainly avoid baking cupcakes at a lowered temperature again, though the lower temperature would probably work well for producing ultra soft and tender layer cakes. The article The Ultimate Cupcake Guide was originally posted at Relish.com. 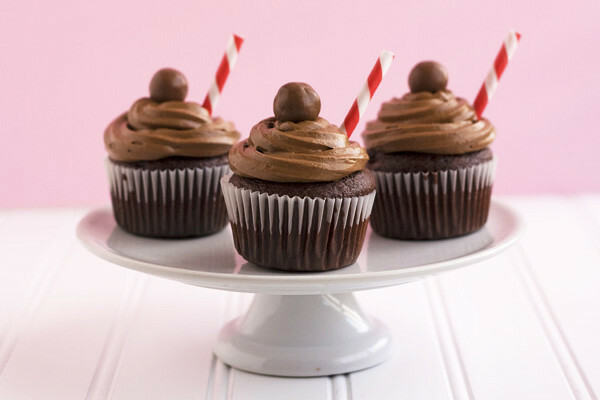 Now time for part two of this post, a round up of my favorite cupcake recipes from over the years! If you can’t tell, I love chocolate so many of these recipes incorporate it in some way. I can’t wait to use what I learned while writing this cupcake guide to make even more scrumptious cupcake recipes to share with you. Have you made any of these recipes? Which were your favorite? 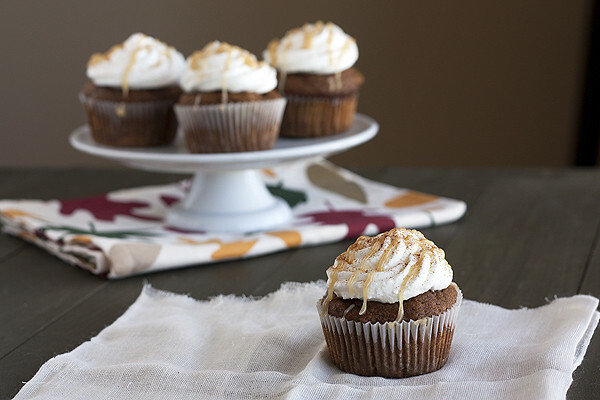 Be sure to follow me on Pinterest for more cupcake recipes! Your round-ups are awesome. I headed over right now! This is SO interesting. I’m on the never-ending quest for the perfect yellow cupcake. I wonder how they would taste with part cake flour, egg yolks and sour cream? I guess the possibilities are nearly endless! Girl, you amaze me!! Headed to check out the post now! I actually did my own tests with this recipe. Since it was so basic, you could really go anywhere with it. I didn’t have enough sour cream to substitute the milk completely, so I added in half of each. I also added in one extra egg yolk. The cupcakes definitely yielded more than a dozen for me, and the results (looks-wise) matched the cake flour one. However, the texture was heavy , yet spongy and light–something dense that melts in your mouth, but you could have another and another. I wanted to enhance the tang of the sour cream, since the batter did smell a little plain, so I squeezed in some lemon juice and added in more vanilla as well. With some frosting, it was a great confection that everybody couldn’t wait to get their hands on. Thank you. Hi! Fromage blanc is a good substitute, and creme fraiche should work too! Another alternative to sour cream is (always) yoghurt! What would you recommend I use for a frosting on the chocolate stuffed red velvet cupcakes? Great comparison! 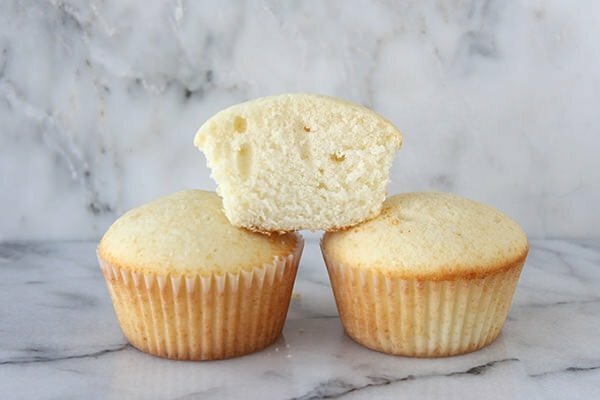 I found it really useful to learn how different ingredients affect cupcake texture and taste. My challenge is that I can’t have any cow dairy (I can’t tolerate a protein found in dairy milk). I’m wondering if anyone has tried making cupcake with goat milk or goat butter instead? I use rice milk in muffins and they taste good, but the domes fall. Hi Beth, unfortunately I haven’t tried using any goat milk products. 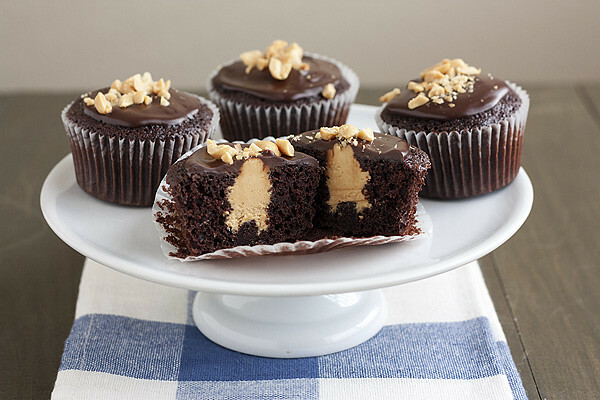 I have had good luck with almond milk and Earth balance butter in baking, but haven’t tried them with cupcakes. Mel below commented saying that macadamia oil is a good butter substitute, that might be worth trying! This was so useful! I’ve always wanted to do this test myself or try to find a simpler explanation as to why some recipes call for this and that. Thanks for teaching me a little something and making me a better baker! Hola!! !Lamento no escribir inglés!! !Pero no puedo dejar de felicitarte por tus incursiones y pruebas, que tanto nos ayudan en la cocina! !Cariños y quedo esperando mas buenas notas !!! hello. im from indonesia, im realy realy love your blog. my inspirations. i wish and i hope i like you soon.. I was wondering how you exactly did your test? Did you bake the cupcakes all the same day or on different days? Were all liquid ingredients (and I would consider the sour cream and eggs liquid with this question) at room temperature or were they used straight out of the refrigerator? If they were at room temp, was it consistent across recipes or did some use room temp ingredients and some not? This can affect the degree to which a cake domes, which is why I would like to know. As I mentioned in the post, I did my best to keep the results as consistent as possible. Everything was baked on the same day so they could be photographed together the day of baking. Ingredients were at room temperature, each batch was baked separately in the same (but completely cool) baking tin, in a carefully monitored 350°F. oven. Nice to see that side by side comparison! Just a side note, If you use sour cream or other soured milk product in the batter, there is no need for baking powder. Baking powder has the acidity already built in to the right ratio to produce the rise. Baking soda has no acidity, so it is better to use when you have a strong acid for the liquid. When you add a soured milk product, you are adding more acid, which throws off the acid/alkaline ratio… So you need more alkaline to restore balance. I have found that usually 1/2 tsp baking soda and 1/2 tsp salt to a cup of soured milk produces a pretty good rise for me.. but you can experiment. Thanks for your feedback! I tried to only change 1 element in each batch, so I refrained from altering the leaveners in the recipe. Sounds like you have a good understanding of baking science! What if you wanted a cupcake that had a moist, shiny domed top wit a soft and granular inside? Loved this guide. It’s so much more fun and personal than the boring text books I had at culinary school. My personal fav is to use the sour cream. Love it! I have to make 3 dozens of red velvet cupcakes tomorrow, and I can’t find all-purpose flour anywhere. All I have is cake-flour and I’ve seen from a bunch of people that cake flour just produces dry cupcakes, and I have no idea what to do. I have no all purpose flour at all, so I can’t mix half and half, what to do? I read it and my passion for baking the right cup cake has gone more stronger. Every time I bake something goes wrong. Lets hope for the best.i will consider mixing up of the two flours one. I really appreciate your effort for the learners like me. Thanks for a great great guide! I would want to make chardonnay cupcakes, would you think it is possible to relace the milk with chardonnay? Great post! I always use oil in my cupcakes and muffins instead of butter. I like to use grapeseed oil, because it has such a neutral flavour that you can’t taste it in the finished product at all. While the cakes are less buttery, I find that the crumb is still nice and soft (and hey, less butter in the cake means you can have more buttercream frosting!). Thanks for going to the effort of doing such a comprehensive test! Wonderful guide!! I tried the controlled recipe but the cupcakes domed and cracked a bit in the middle. However, the taste is absolutely great and I love the texture so fluffy and airy. I wonder what caused the cupcakes to dome and crack? Hmm sounds like they could be overmixed. Stir in the flour until JUST combined. This really helps a lot. When I bake yellow cupcakes or cakes for that matter, they never come out right. They’re usually very dry..
My question is, what if you did the flour and egg yolk recipe together? Like the half flour half cake flour and adding that extra egg all together?? Hi, i tried making the cupcake with the extra egg yolk in the batter and it turned out very soft but not moist and it also crumbles when seperated from the liner.Could you please tell me a solution? Should i increase the butter quantity ? Would this transfer to any basic cake recipe? Chocolate for example? Probably not chocolate since the addition of cocoa powder or melted chocolate can really change the structure and texture. Let me know if you do experiment at all, though! I loved your site. Thank you so much for sharing your knowledge about cupcakes. Hi! I have been wanting to recreate a hornets nest cake without any box mixes. It is usually made with a yellow cake mix and a box of vanilla pudding to make it super dense (almost like blondies). Since I’m not using a box pudding, I was wondering what I could do to make a typical yellow cake denser. Perhaps sour cream and more egg yolks? Thank you! I dont have whole milk, we only have 1% on hand, but I do have some vanilla greek yogurt….could I poss had a lil of both together? suggestions? Does the yogurt have a lot of sugar? Is it low fat? You don’t want it to change the taste or texture too much. also, has anyone used coconut oil in place of the butter in a recipe like this? if so how did it turn out/how did it taste? thank your for your wonderful guide to bake a perfect cupcake. I am not sure, but where does it say on the recipe to put in the baking powder and salt. It is in the ingredient list but not mentioned in the recipe. Thanks! 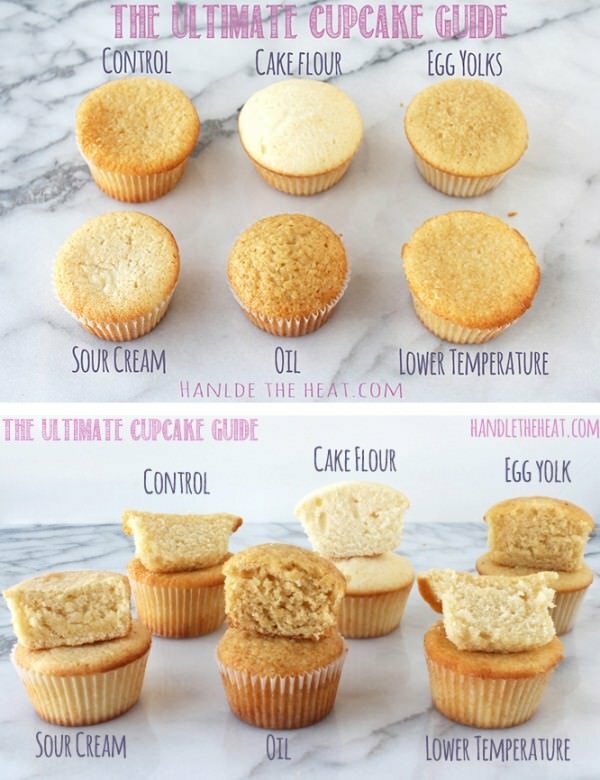 This was incredibly helpful and informative, and answered a lot of questions for me as to WHY my from-scratch cupcakes were flat and dense. I’m going to try your recipe. Thank you! Hello I was wondering if you had a secret from keeping my cupcakes from getting chewy and tough. I absolutely love the control cupcake recipe, and I sometimes throw in an extra yolk. For my daughter’s birthday cake, she wanted a chocolate cake–and not cupcakes. I doubled your recipe for the cake and swapped out 1/3 of the flour for natural cocoa powder. I baked it in a regular cake pan. The result was heavenly. I also used the linked buttercream recipe on this page with the addition of some cocoa to make chocolate buttercream. Thank you for these wonderful recipes! So Ive started adding an extra egg yolk to my recipes but noticed that when I do that I end up down 1-2 cupcakes, any idea why? Am from India & a vegetarian. Therefore, cannot use eggs. Please suggest a substitute for eggs that I can use in the cupcake recipe. If I want to make like (ube macapuno) flavor or any kind of flavor cupcakes, how would I measure the ingredients? Hi, i just found your site and I’m excited to keep exploring it more. 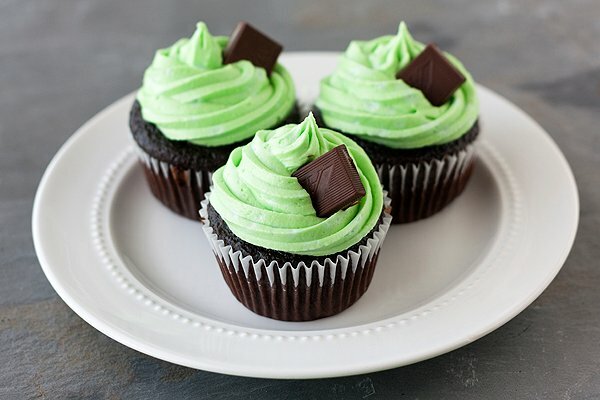 I have a question about high altitude cup cake specific baking. If my oven temperature is not at 375 they just pit out. I have tried changing flours and combining flours- but the batter is just too heavy most times. Would upping the temp for this recipe work well? or do you think I need to mess around with the flour combination? thanks for sharing all of your hard work and sweet passions. Ive been using that chocolate recipe from brown eyed baker for a long time and its my favourite, although your frosting is different the cake recipe is exactly the same. Hallelujah! I’ve been searching for a good yellow cupcake recipe for years! I’ve tried at least a dozen recipes from some very reputable sources. Always the same issue: dry or flavorless or both. I truly didn’t think it was possible to have a good yellow cupcake made from scratch. I tried your recipe today with the two extra egg yolks and it turned out great! Flavorful and moist. I decided to top it off with your buttercream recipe with cocoa powder added. Delicious. Thank you Tessa!!! wondering why if you were trying to change only one thing, why you sifted the cake flour but not the regular flour. that alone could cause a difference due to volume and aeration. also, if you want a more domed cupcake, here is a trick. preheat oven to 375, then when you put the cupcakes in, turn it down to 350. the extra initial heat helps them get that extra rise. When you substitute oli for butter you should reduce the amount at least fo 1/3. I experimented with one of my mom’s favorite recipes (sadly it wasn’t a cupcake). The original recipe listed 125 g of margerine (ewwww, hate this stuff). When I used butter, I used up to 150 g and all was OK. Good texture, gorgeous taste. But when I used vegetable oil, i could add no more than 90 g., otherwise I’ve got fried oily sponge. Even 70 g worked well. I love your ultimate guides!! I’ve been making your ultimate muffin recipe for years now. It’s my go-to for muffins! Would the results of this cupcake test apply to full sized cakes as well? My yellow homemade cakes are more tough than I would like most of the time. Maybe adding half cake flour would help? Or an extra egg yolk? I’ve been lowering the baking temperature lately and it helps keep the cake top flat so I don’t have to trim it before decorating which is awesome! Thanks for taking time to do these experiments! Yes, most of the principles will apply! If your cakes are coming out tough make sure you’re measuring your ingredients with a scale (to avoid accidentally adding too much flour which is all to easy to do with measuring cups) and mix the batter until the wet and dry ingredients are JUST combined. Good luck! Tessa, thank you for this Ultimate Cupcake Guide! I’m planning on making cupcakes for a baby shower and wanted to know which cupcake texture would you prefer. Would you prefer the SOUR CREAM or the EXTRA EGG YOLK for a yellow cake with lemon curd filling cupcake? Thank you! O wow! I am SO GLAD I read this article! I have a wonderful cupcake recipe using greek yogurt and oil. It is a lemon cupcake and absolutely delicious. I have experimented with chocolate and red velvet flavours with this recipe and it worked great, but the plain vanilla flavour was just awful! The oil being the biggest problem. Now I know why! 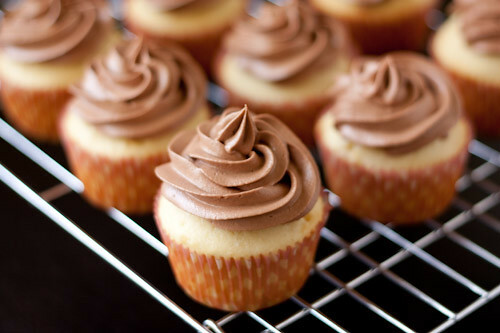 I will try making the recipe with butter instead of the oil for the vanilla flavoured cupcakes! I am so excited now! Can’t wait to try it! I do have a question about flour. Here in South Africa we only have bread flour, self raising flour and cake flour. We use the cake flour basically for everything. What is the difference between cake flour and All Purpose flour? Do you have any tips for me when a recipe calls for AP flour? Thanks for this in depth information..It was a real eye opener especially using oil n butter for different flavours. Hi. How well will the control recipe work as a layer cake? And if so, should it be doubled? Hi Tessa, I really enjoy reading all of your tips and very helpful baking information. Thank you so much for sharing. l do not know what this is ,and not sure if I have ever seen this in the supermarket in Australia. Am so glad I stumbled upon ur website. I tried the cupcake version with extra eggs but added buttermilk instead of normal milk and also and also a pinch cinnamon powder fot flavoring. It turned out soft and yum. I will be trying next with sour cream. Thank you for the lovely recipe.